Home Informative Where Does Pepper Come From? Pepper is the most common spice in the world. In fact it’s so common that even people who insist they don’t like spicy food still use it regularly. Almost every table in the western world (and in many other cultures) has a pepper pot sitting there beside the salt shaker. Pepper is one of those things that’s so ubiquitous that most people don’t even wonder where it comes from – and the fact is that most people don’t know. First let’s have a closer look at what pepper is. Many of the plants we call peppers, including bell peppers and chilies, are actually members of the nightshade family. This group of plants includes deadly nightshade and tobacco, but also many of the most common vegetables – potatoes, tomatoes and eggplant as well as cayenne and jalapenos. True peppers are something completely different. The pepper you sprinkle on your food is black pepper, and it comes from Piper nigrum, a flowering vine in the Piperaceae family. Do you prefer green or white pepper? Well, they come from exactly the same plant, just prepared differently. 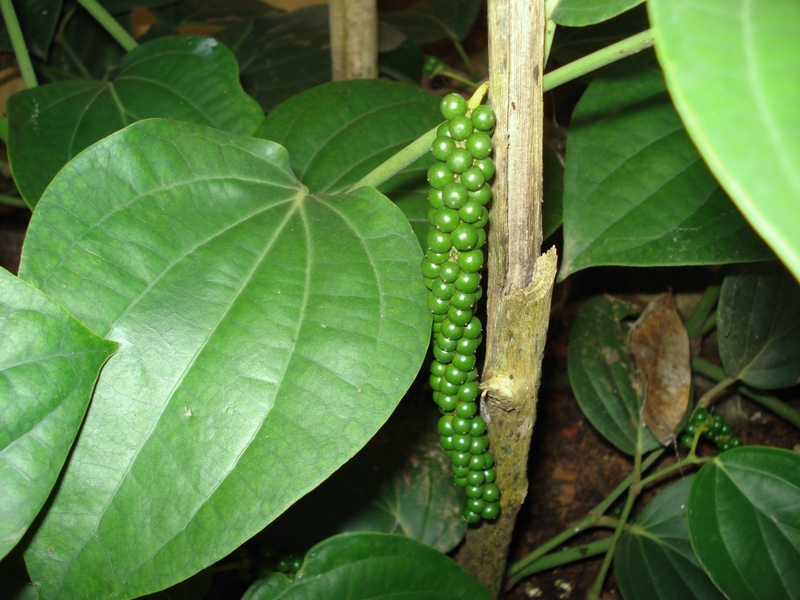 Piper nigra is a spreading, woody vine that grows to about 13 feet high. In the wild it can often be found growing on trees; cultivated plants are usually supported by a pole or trellis. Leaves grow from the stem, six to eight inches apart on alternate sides, the leaf nodes also send out short, hanging spikes which carry the small flowers. The flowers aren’t too spectacular, and at first glance neither is what replaces them. As they wither tiny fruits appear, clustered tightly together; each spike can carry up to 200 of them. The fruit is a drupe – a single seed surrounded by a layer of flesh – like a peach, but much smaller. The average size of the drupes is about a fifth of an inch in diameter. As they grow they’re green, and look like bunches of very small grapes. Harvesting pepper begins when the drupes at the base of the plant start to turn yellow, then red. The spikes are picked, and laid out in the sun to dry. It’s important to do this while the fruit is still unripe and hard. The drupes are left out until they’re completely dry, then stripped from the spikes. Now, if you look at one, you’ll immediately recognize it as the familiar black peppercorn; what remains is the small, spherical seed with the skin and flesh reduced to a thin, wrinkled outer layer. These are then either ground, or sold whole so you can grind them yourself. So what about white and green pepper? They’re exactly the same fruit, but the preparation process is slightly different. Black peppercorns start out green when they come off the plant, but darken after being dried. Green peppercorns are also picked before they’re ripe, but the drupes are treated to preserve the color –freeze drying is the usual way to do this. Making white pepper is a bit more complicated. It still comes from the same drupes, but this time they’re allowed to ripen before being picked. Then, instead of being laid out in the sun, they go through a process called retting. The fruit spikes are soaked in water for about a week, so most of the skin and flesh decomposes. That just leaves the hard seeds, which are shaken and rubbed to remove any remaining flesh before being dried. The seeds are an off-white color, giving white pepper its characteristic color. It also has a different flavor; some of the taste of black pepper comes from compounds found in the skin and flesh, but not in the seed. If you buy fancy mixed peppercorns you’ll see red or pink ones in there. These are also dried drupes, but they’re from an unrelated plant – the Peruvian peppertree. The process for making them is the same though, and they have a very similar taste. They’re actually related to cashews, so can be dangerous for anyone with a nut allergy. The origins of the black pepper plant aren’t well known. It originated somewhere in South or Southeast Asia, but it isn’t clear where. That’s because black pepper has been traded for at least 4,000 years. The ancient Egyptians used it, and it was obviously a luxury item – peppercorns were used in the mummification rituals of pharaoh Rameses II. Who did the Egyptians buy it from? Nobody knows; their empire never extended into the regions where pepper grows, so perhaps the lucrative Central Asian spice routes are at least that old. By the time of the Roman Empire the plants were grown almost everywhere they would thrive. The Romans imported the spice from India’s Malabar Coast region, and rather than enriching the traders along the spice routes the Empire sent a large merchant fleet to Asia once a year. Reaching as far as China, the ships called at Malabar on the way home to fill any spare hold space with pepper. The precious spice would then be landed in Egypt and sent overland to Italy. As Rome’s empire expanded it became easier to import from India and the price of pepper fell. After Rome fell pepper again became scarce in Europe, and in the Middle Ages the price soared. In the early 16th century Portugal risked war with England and the Italian states to gain a monopoly on pepper imports; the spice was valuable enough to make the danger worthwhile. Noblemen would display barrels of peppercorns at their banquets to show off their wealth. Some who wanted to look richer than they actually were filled the barrels with sand and put a thin layer of pepper on top, but the deception was often uncovered by thieves – guests at banquets were prone to filling their pockets with corns while the host wasn’t looking. Today pepper is a cheap, common seasoning. It’s still mostly grown in southern Asia – Vietnam is the largest producer – but it can be easily bought anywhere in the world. Fast food restaurants fill boxes with free sachets of it, and almost any meal you buy will contain some. Now you know where it comes from, though, so perhaps you’ll find it a little bit more exotic!